Another round of snow paired with a gray sky in the midwest this morning– at least the temperatures aren’t so bad. I needed to brighten up my surroundings, so I blended up a Sunshine Smoothie. I’ve likely mentioned this before, but I go through a bit of a kumquat love-fest this time of year. They’re brilliant in this marmalade, perfect in vinaigrettes for salads, and they are downright fabulous blended into smoothies. 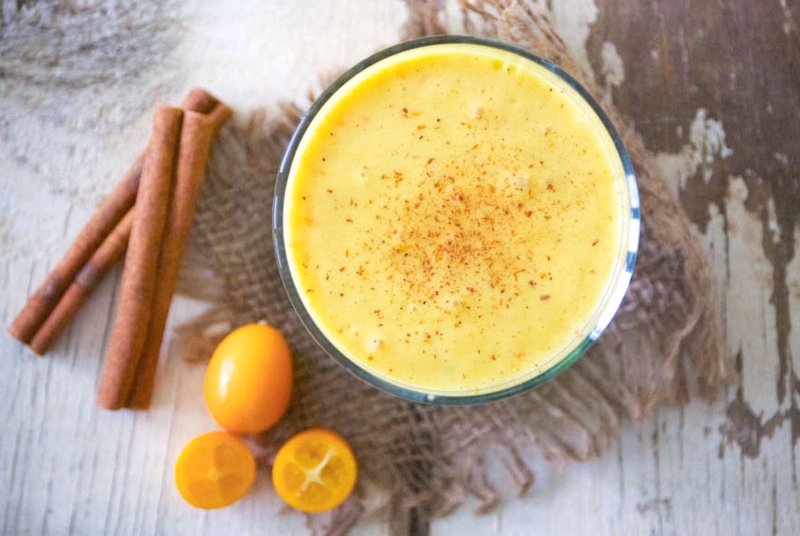 This time, I’ve decided to craft a smoothie using kumquats as the star ingredient. Yes, I love a smoothie loaded with greens as much as the next person (this one is my personal favorite), but sometimes I want something…a little less green. 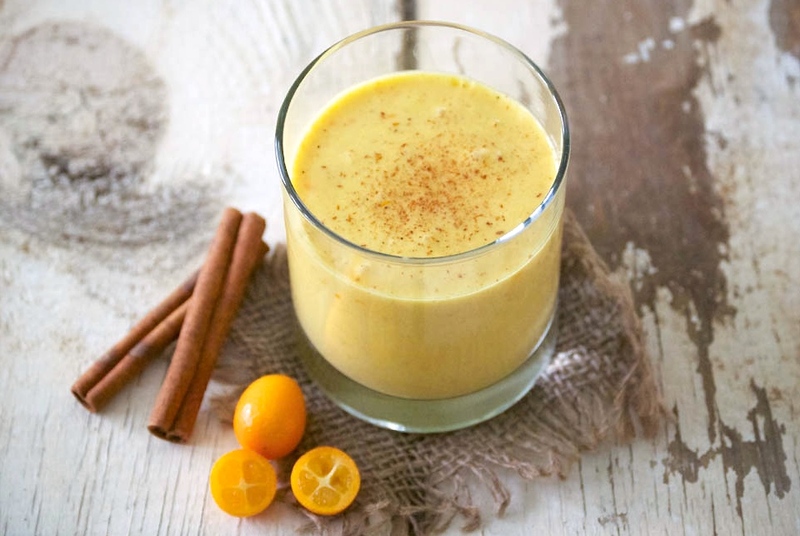 The kumquats give this smoothie a fresh vibrancy that will wake you right up. I also recommend using either fresh or frozen organic mango. Plain yogurt is the protein that will keep you from getting hungry– I suggest using whole milk yogurt to also help with that. And turmeric– a fantastic, healthy ingredient that you should eat more of anyway. You can read about it’s specific properties here. Curries are a great way to incorporate more turmeric into your diet, or throw a little into a soup, such as this one. Adding just a bit to this smoothie completely works, too. 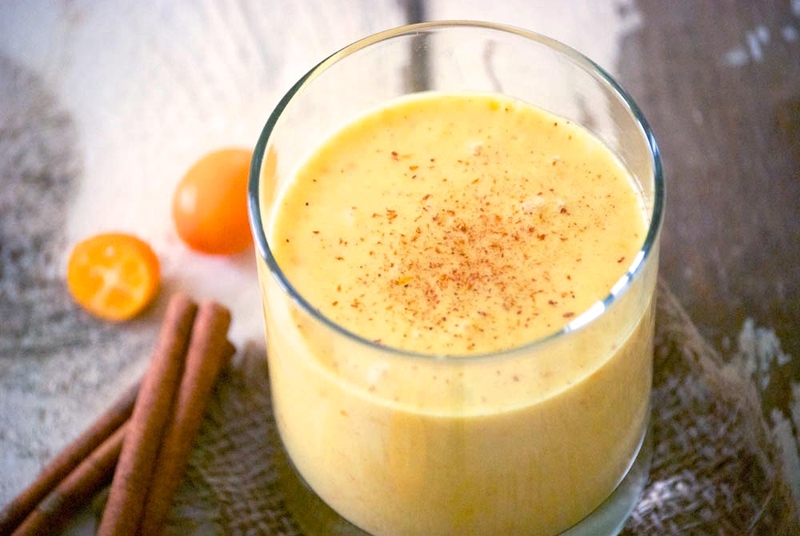 It pairs wonderfully with the cinnamon and citrus flavors. No need to peel the kumquats, just cut them in half and remove the seeds. Place everything in a blender or food processor and whiz it together. Hope you enjoy! Place all of the ingredients into a blender or food processor and blend until smooth. Serve with a sprinkle of cinnamon on top. Enjoy!